Through her art, Maddy Keener aims to show that women have depth and should be conveyed as more than just beautiful or romanticized. She wants to make sure that women are being widely represented in artistic ways. Keener is a senior studying Art Administration with an English minor. Her main focus is portraits and figures of women. Even though she has a love for art history, she does not agree with some of the views presented throughout, with a slant toward entertainment and objectification. She wants to create something new, something that will empower women. This year she is working on a portrait series focused on the portrayal of women. She uses dark hair and patterned torsos to illustrate them. Her purpose with this series is to increase the representation of women without idealizing them. She uses bright, poppy colors with a combination of neutral, aloof and even sometimes distant facial expressions. “This serves as a juxtaposition between bright and happy versus being more distant,” said Keener. Keener gets inspiration from music that she listens to, such as that by the artists Grimes and Banks. There is one song that has especially inspired her art, “Venus Fly” by Grimes. The message of the song is that women are scared of being objectified and that female artists have bigger goals and dreams that go beyond their appearance. One idea that has come to mind for her senior show is to include quotes from books that have inspired her and pair the text with a painting. The portraits would not necessarily illustrate the text, but placing them next to each other would create a museum or gallery style. As an Art Administration major, Keener is looking to go into museum work, possibly as a curator, or to work in galleries or for an art journal. This work would involve combining text with art and her senior show would serve as practice for this profession. One thing that she has found surprising as she has studied here at Goshen College is how her high school interests have reappeared during her time here. Keener did not initially pursue her high school interests in college, but looking back on her college journey, they seem to have come back. 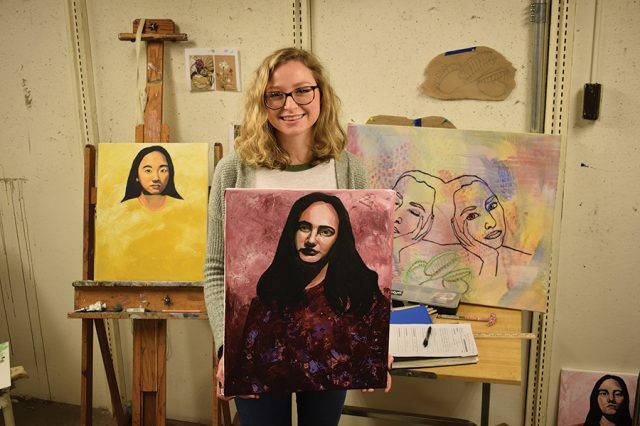 She did not know exactly what she would be interested in studying but since declaring her Art Administration major, she now sees her interests in her studies. She was interested in art and portraits in high school but did not think to pursue that in college. “What I’m doing now really mirrors what I was preoccupied with [in high school]. I did not know what I was interested in until I found it and looking back now, it is just so clear,” Keener said. Keener thinks people should have an “ear to the arts” and not pass it up so quickly. Students can show support for their classmates by taking the time to see what they have created, as well as taking the time to see what is going on the art realm of Goshen.